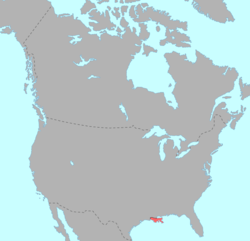 Chitimacha (/ˌtʃɪtᵻməˈʃɑː/ CHIT-i-mə-SHAH or /tʃɪtᵻˈmɑːʃə/, chit-i-MAH-shə) is a language isolate historically spoken by the Chitimacha people of Louisiana, United States. It became extinct in 1940 with the death of the last fluent speaker, Delphine Ducloux. Although no longer spoken, it is fairly extensively documented in the early 20th-century work (mostly unpublished) of linguists Morris Swadesh and John R. Swanton. Swadesh in particular wrote a full grammar and dictionary, and collected numerous texts from the last two speakers, although none of this is published. Language revitalization efforts are underway to teach the language to a new generation of speakers. Tribal members have received Rosetta Stone software for learning the language. As of 2015, a new Chitimacha dictionary is in preparation, and classes are being taught on the Chitimacha reservation. ↑ Raymond Fogelson, William C. Sturtevant. Handbook of North American Indians, V. 14, Southeast. Government Printing Office. pp. 80–. ISBN 978-0-16-087616-5. ↑ Hammarström, Harald; Forkel, Robert; Haspelmath, Martin; Bank, Sebastian, eds. (2016). "Chitimacha". Glottolog 2.7. Jena: Max Planck Institute for the Science of Human History. ↑ Swadesh, Morris (1948). "Sociologic Notes on Obsolescent Languages". International Journal of American Linguistics. 14 (4): 226–235. doi:10.1086/464009. JSTOR 1262876. ↑ Swadesh, M. (1934). "The phonetics of Chitimacha". Language. 10 (4): 345–362. doi:10.2307/409490. ↑ "YouTube – Chitimacha Language Episode – Finding Our Talk 3". youtube.com. Retrieved January 26, 2010. ↑ "Press Release, Media Room, Rosetta Stone". Retrieved 2012-08-26. ↑ Larry Abramson (Director) (2010-02-02). "Software Company Helps Revive 'Sleeping' Language". All Things Considered - NPR. Retrieved 2012-08-26. ↑ Heflin, Judy (August 2015). "The Successful Revival of the Chitimacha Language". Language Magazine. Retrieved 2015-10-03. ↑ Brown, Cecil H.; Wichmann, Søren; Beck, David (2014). "Chitimacha: A Mesoamerican language in the Lower Mississippi valley". International Journal of American Linguistics. 80 (4): 425–474. doi:10.1086/677911. "Chitimacha Language and the Chitimacha Indian Tribe (Chitamacha, Chetimacha, Shetimasha)". Retrieved 2012-08-26. John Reed Swanton (1919). A structural and lexical comparison of the Tunica, Chitimacha, and Atakapa languages. Govt. Printing Office. Retrieved 25 August 2012. Thomas Noxon Toomey (1914). Relationships of the Chitimachan Linguistic Family. Hervas Laboratories. Retrieved 25 August 2012.